• The stomata of angiosperms respond to changes in ambient atmospheric concentrations of CO2 (Ca) in ways that appear to optimize water-use efficiency. It is unknown where in the history of land plants this important stomatal control mechanism evolved. Here, we test the hypothesis that major clades of plants have distinct stomatal sensitivities to Ca reflecting a relatively recent evolution of water-use optimization in derived angiosperms. • Responses of stomatal conductance (gs) to step changes between elevated, ambient and low Ca (600, 380 and 100 ìmol mol−1, respectively) were compared in a phylogenetically and ecologically diverse range of higher angiosperms, conifers, ferns and lycopods. • All species responded to low Ca by increasing gs but only angiosperm stomata demonstrated a significant closing response when Ca was elevated to 600 ìmol mol−1. As a result, angiosperms showed significantly greater increases in water-use efficiency under elevated Ca than the other lineages. 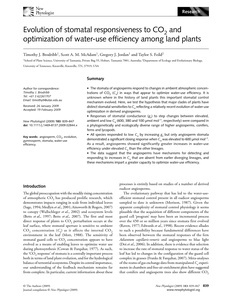 • The data suggest that the angiosperms have mechanisms for detecting and responding to increases in Ca that are absent from earlier diverging lineages, and these mechanisms impart a greater capacity to optimize water-use efficiency.